Pixel Slate feels great in your hands thanks to its evenly balanced center of gravity, rounded edges and curved 2.5D glass. At just 7mm thin and 1.6 lbs with a display that covers nearly the entire front of the device, Pixel Slate was designed to maximize what matters most to you. Your music sounds great too. Pixel Slate has dual front-firing speakers that were algorithmically tuned to perfection for crisp highs and clear lows. And there’s no better way to see and hear the difference than with three months of YouTube TV* on us with the purchase of a Pixel Slate or Pixelbook. You can also connect with the people you care most about. Pixel Slate includes 8MP cameras on both the rear and front, and the front-facing Duo Cam provides an extra wide field of view with exceptional low light performance. You can even take great photos using portrait mode, which uses on-device machine learning to keep a single point in focus. Pixel Slate is powered by a reimagined Chrome OS that enables easy navigation on a touchscreen. It’s designed to be held in your hands, while giving you a full desktop experience. You can even run Linux if you’re a developer. It makes getting things done easy, with the Google Assistant built in, a new launcher, machine learning-generated suggestions for the apps you use most, and multitasking tools like split screen. It's also got a full desktop Chrome browser—with all your favorite extensions—so you won’t be limited by the mobile version of a website on Pixel Slate. And what would modern computing be without apps? GSuite apps, which are used by more than a billion people worldwide to collaborate better, work great on Pixel Slate. Google Play gives you access to millions of apps from notetaking to gaming, entertainment, fitness and much more, both online and offline. When you’re done interacting with all this content, we’ve built in digital wellness features like Night Light and Do Not Disturb to ensure you can disconnect when needed. You can even set digital ground rules for your family with Family Link, which gives you control over how your children’s devices are used. If you want to be seriously productive, you need a great keyboard. Pixel Slate Keyboard, which pairs perfectly with Pixel Slate, includes a full-size, backlit keyboard, with round Hush Keys™ that let you type quietly, a dedicated Google Assistant key and an extra large trackpad. The folio is adjustable so you can comfortably work at any angle, then it turns into a slim protective case when you’re on the go. 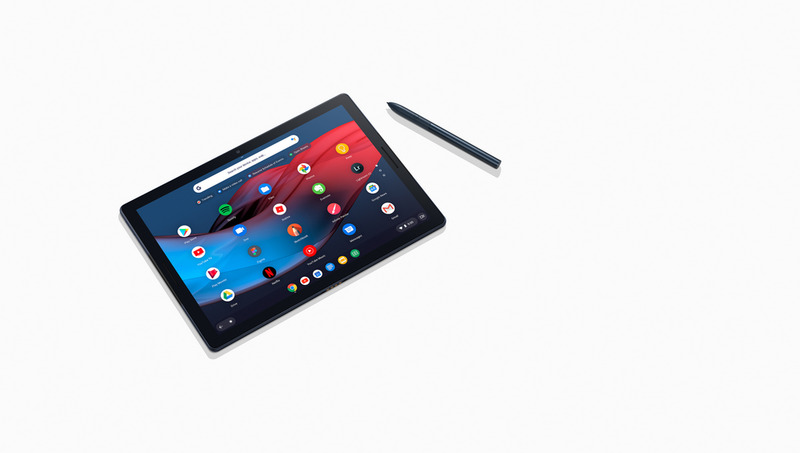 Pixel Slate also works with Pixelbook Pen, which launched last year and had the lowest latency of any digital pen out there. This year it’s even better and comes in a new Midnight Blue color. Starting at $599, Pixel Slate comes in several configurations. Pixel Slate Keyboard is $199, and Pixelbook Pen is $99. All three will be available later this year** on Google Store, and at major retailers in the U.S., Canada and the U.K.
*Promotion available in the U.S. only. Pixelbook promotion starting on November 1. Pixel Slate promotion starting the date it becomes available for pre-orders. Terms and restrictions apply.